The Rosary Girls by Richard Montanari - Kerrie from Mysteries in Paradise recently reviewed the third book in this series and gave it a seriously good review! Because I can not possibly start anywhere other than the beginning of a series, this is the first book! The Summoning by Kelley Armstrong - New series + Kelley Armstrong = No brainer! Grave Goods by Ariana Franklin - Whether this author is writing under her real name, Diana Norman, or this name, I really enjoy her writing, and I am looking forward to catching up with Adelia Aguilar and her friends again. Tales from Outer Suburbia by Shaun Tan - A couple of years ago I read The Arrival by this author and absolutely loved it! I had every intention of reading anything I could find by him, but that kind of hasn't happened. This is his latest book which came out last year. 1) display the grasshopper award on your blog knowing you have touched someone you may never meet IRL. 2) pass this on to any fellow bloggers who have taught, inspired or entertained you. Alessandra from Out of the Blue and Eva from A Striped Armchair, who host Library Loot each week. Raidergirl3 from An Adventure in Reading, who each week asks the question "It's Tuesday, Where are you?. I tend to answer this one in the comments on her blog but I do participate regularly in the meme, and it is one that I look forward to each week. 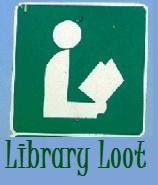 I'll enable you with your library addiction Marg, I picked up two more books from the library today and returned none. My excuse was they were on reserve so I had to pick them up. I currently have 15 books out. I'll just tell you this Melissa (no one else) but if you take your number, swap the numerals around and add one, then you will have the total of how many books I currently have out from my library! I did take a whole heap back a couple of months ago but the number has been creeping up again! I hope you like The Summoning! I really loved it and can't wait for The Awakening to come out! “Grave Goods”? Good for you! I’m so jealous! I have it on hold and still haven’t gotten it. Thanks for mentioning “The Summoning”, I’m gonna find it ASAP. Story of my life...bringing home more books that I return.